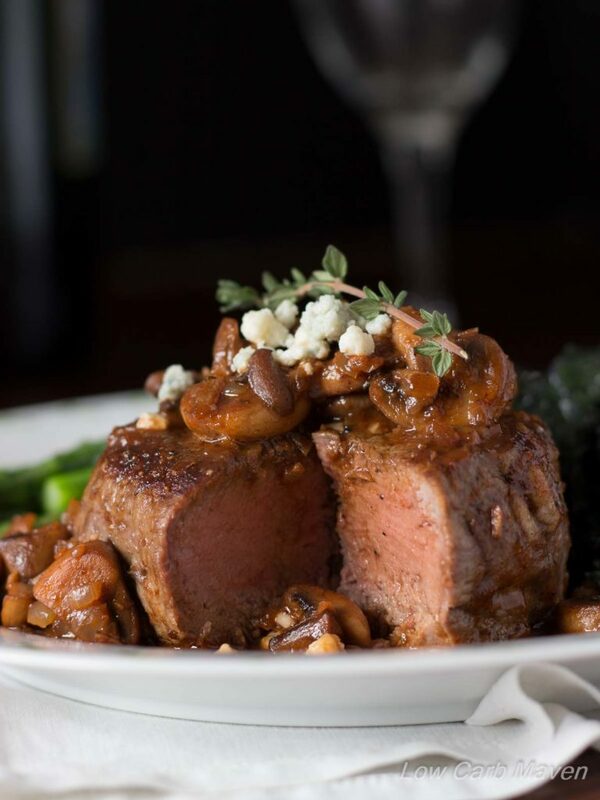 A beautiful meal of pan seared filet mignon with mushroom red wine sauce and topped with crumbled blue cheese served with buttered asparagus. Pinable cooking chart in post. I love a good steak and my husband does not. He’s a fish fella. So, it was to my extreme pleasure that he “Mmmm’d” his way through this dinner the other night. Well, through most if it. I noticed a few pieces of abandoned asparagus on his plate when cleaning up. Asparagus is also not his favorite. I put a lot of thought into this pan seared filet mignon dish. I knew I wanted to do a nice steak and I knew I wanted a classic mushroom and red wine sauce because it’s…. well, it’s classic – which means it’s great. And it is. I tested this recipe on a nice thick boneless New York Strip. It was delicious, really a standout. But, as I ate the steak, there were a few times where I caught a piece of gristle. It didn’t exactly scream romance. I had my husband buy a whole beef tenderloin at Costco so we could have filet mignon. I trimmed and portioned it myself, which I learned in a culinary curriculum years ago. I found this great video from Jacob Burton on how to butcher a beef tenderloin for you first timers or those who need a refresher. My tenderloin yielded 18-20 servings, so it was worth the price for me. For those who just want to buy two filets from the store, aim for 6 ounces a piece but 8 is better. But trumping weight is thickness. 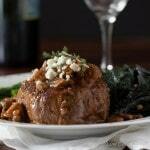 If you’re looking for a whole filet mignon recipe, check out this one at Wholesome Yum. The filet in the picture is about 9 ounces, which is huge. I cooked two and served the meal to my family of 4 for dinner. Your butcher can cut your filets to order, but the two most common sizes found in the grocery store is 4 ounce (or petite filet) or 6 ounce. 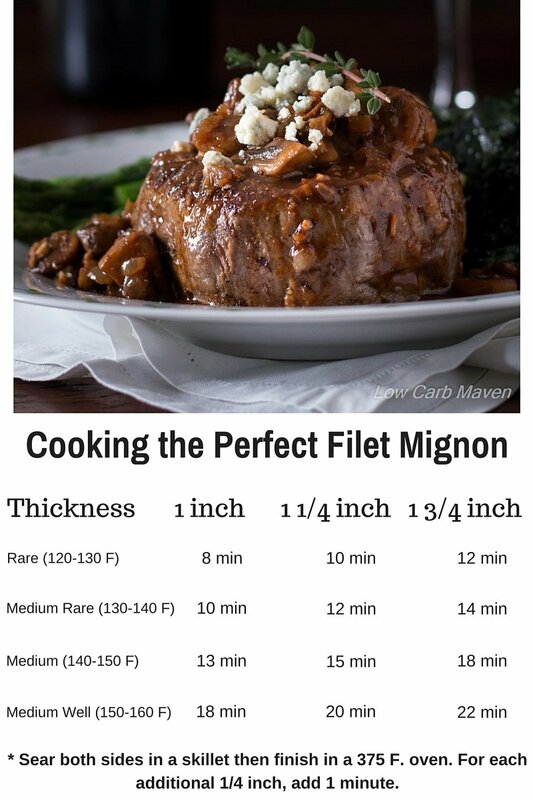 For proper cooking, it’s always better to go with a thicker cut, so aim for a 6-8 oz filet mignon which is at least an inch thick. I wouldn’t get a petite filet because the margin for error in cooking is pretty small. I think they are best seared in a pan for about 2 – 2 ½ minutes per side depending on how cold they are to begin with. A six ounce filet is easier to cook and looks prettier on the plate. But trumping weight is thickness. If your filet mignon is a little flat I have a great trick: Tie a piece of string snugly around the middle of the steak, like a belt, to force it together, making it higher or thicker. It will cook much nicer for you. [NOTE] This is a very large dinner and there will be left overs. The nutritional information is for two person’s consuming the entire meal – which is a lot of food! 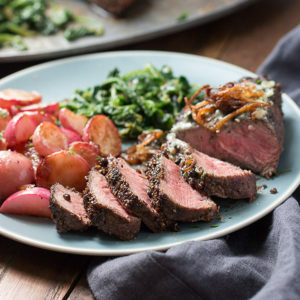 This whole pan seared filet mignon dinner serves two (with leftovers!) and is 10 net carbs per serving. A beautiful meal of pan seared filet mignon with mushroom red wine sauce and topped with crumbled blue cheese served with buttered asparagus. The night before: 1. Salt all sides of the filet, cover and refrigerate. 2. Put the wet ingredients for the red wine mushroom sauce in another container, stir together and refrigerate. 3. Cut about 1 1/2 - 2 inches off of the bottom of the asparagus and then lightly peel the lower half of each spear with a vegetable peeler. Place into a microwaveable serving dish, cover and refrigerate. 4. Remove about 1/4 of the sliced mushrooms from their container and place into a plastic bag and save for another use. Cut the remaining mushrooms in half, return them to their container and cover with plastic wrap. About 40 minutes before Cooking: Remove the filet mignon from the refrigerator and place on a plate to come to temperature. Place an iron skillet (or an oven safe saute pan) on the stove for the meat and a large saute pan on the stove for the mushrooms and red wine sauce. Remove the wet ingredients for the sauce and the mushrooms from the refrigerator. Remove the asparagus from the fridge, add 2 tablespoons of water to the serving dish and cover again. Mince the onion and press or mince the garlic. Procedure: Preheat the oven to 375 and place the rack in the middle position. Preheat the skillet over medium high heat. Pat each filet dry with a paper towel. Brush all sides generously with olive oil and season all surfaces with salt and pepper. Add a little oil to the skillet and swirl to coat the bottom. Add the filets to the pan and set the timer for 3-4 minutes (3 for thinner cuts and 4 for a thicker cut). Turn the heat to just a hair above medium. When the timer goes off, flip the meat and set the timer for 2 - 3 1/2 minutes. Turn off the heat, add a small pat of butter to the top of each filet and place into the oven. Set the timer per the suggestions in the chart. If you have an electric thermometer, set the temperature for your desired degree of doneness and stick the thermometer into one of the filets - right into the center but not all of the way through the meat. You want it in the middle. Mushroom and Red Wine Sauce: Place the saute pan over medium high heat. When it gets hot, add 1 tablespoon of olive oil. Swirl to coat the pan. Add the mushrooms to the pan and spread them out in one layer. Turn the timer for 5 minutes or cook until the mushrooms have browned nicely on one side. Shake the pan and turn the mushrooms over. Yes, each one. Reduce the heat to medium and cook about 3 minutes. Push the mushrooms to the sides of the pan. Add the onion and garlic and a little bit of oil to the middle of the pan. Saute until they become soft and translucent. At some point they will become mixed in with the mushrooms. Add the wet sauce ingredients to the pan and a few sprigs of fresh thyme. Bring the sauce up to a simmer. Simmer for 5 minutes or until the sauce just begins to thicken. Adjust seasoning with salt and pepper. Add 2 tablespoons of butter to finish the sauce and stir in. Turn off the heat. Finishing: Remove the filets from the oven and lay a piece of foil gently over the top. Let the meat rest for 10 minutes. Put the asparagus into the microwave for about 3 minutes on high. Then, VERY CAREFULLY pull away a corner of the plastic wrap and drain the water. Add two teaspoons of butter and mix. salt and pepper to taste. Plate: Place a filet mignon on each plate. Spoon half of the mushrooms and sauce over each and top with blue cheese crumbles is using. Divide the asparagus between the two plates and serve with a wedge of lemon. This does the trick. It’s an awesome recipe. I have a question. How would I modify it to make multiple filets at once? Say 4 8 oz filets. Hi Amy. I would double the recipe and do everything else the same. You can even serve more with a tenderloin roast. If you opt for that, then season the roast and sear on all sides. Then insert an electric probe into the middle of the roast and set the temperature for your desired level of doneness. When it’s done, spoon some melted butter over the roast and top with blue cheese crumbles. Tent loosely with foil and let it rest. Meanwhile, continue with the rest of the recipe. The butter and blue cheese should make a little sauce which you can spoon over the sliced tenderloin roast. 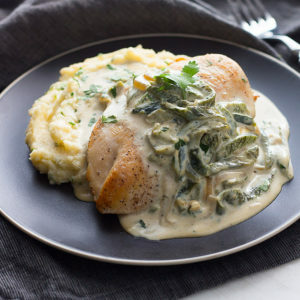 We linked your great recipe in our very post Mother’s Day article. What a great dish. We love your recipes and your pictures are to die for. Keep up the good work, you are a keto hero to us newbies. 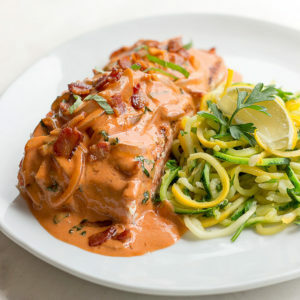 I made this for dinner tonight and it was incredible! My partner said he wanted to bathe in the sauce! Yes, it was that good. 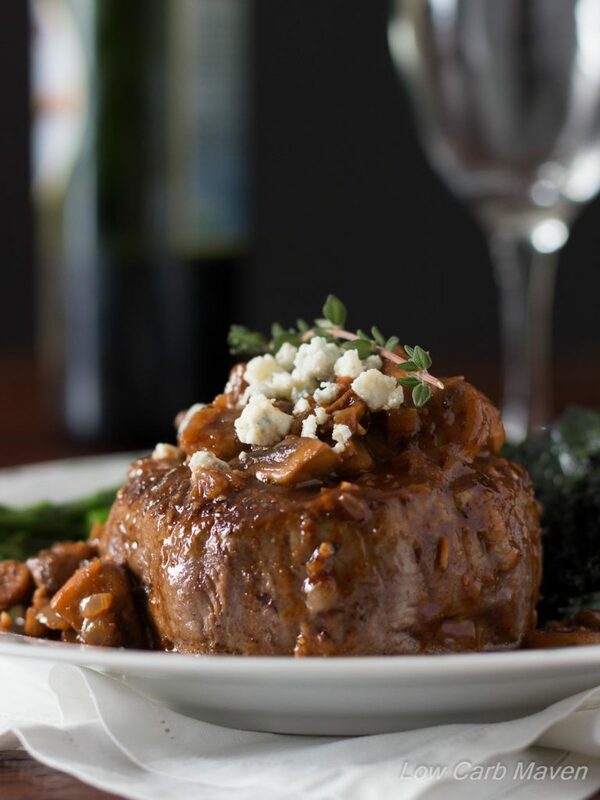 This is going to be our go-to recipe for filet mignon! Thank you for the recipes. I will be using one of the steak meals for company on Valentine’s Day this week.